The Marrambidya Wetland is a valuable community resource for educational, cultural and passive recreational activities. A stunning 20-hectare reserve located alongside the Murrumbidgee River only a few minutes from the Wagga Wagga city centre. 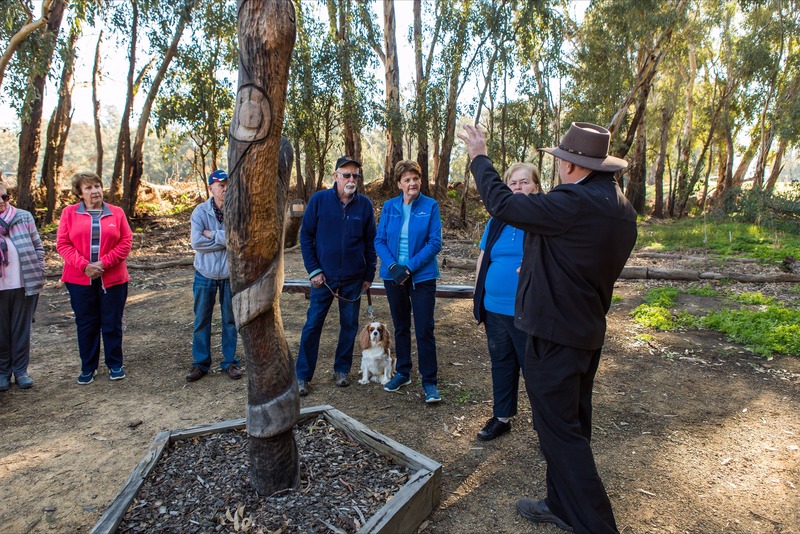 The wetland features a Wiradjuri Healing Place, with natural vegetation, seating area and hand-carved totem pole. The name was selected as the name of this special place to reflect the importance of this site to the local Wiradjuri people and to acknowledge the traditional name of the Murrumbidgee River. The site is also located between two Aboriginal place names, Gobbagumbalin and Wiradjuri Reserve. The Healing Place was created within the Marrambidya Wetland as a place of reflection and healing for all to sit amongst nature with the river flowing nearby. The Healing Place features a number of plants traditionally utilised by the Wiradjuri people. Water was central to the Wiradjuri way of life including the floodplains, creeks, billabongs and the Murrumbidgee River (Marrambidya). Therefore the site on which the Marrambidya Wetland is now situated would have been of great importance to the local Wiradjuri People.